When we first heard about Chargepod's six-way charging system with its custom adapters and all-in-one body, we were skeptical. Is it really worth the price premium to combine all our gadget charging into one place? After getting our hands on it and testing it out on just about every portable device we have, we've come to the conclusion that the Chargepod is the future of gadget charging. That's a bold claim, but once you use it, you'll come to agree with us. See, with standard AC adapters, you'll be hard pressed to fit them all on one power strip because quite a few are large and oddly shaped. Then you'll have to get two power strips (or a power squid), which then means both of your outlets are now occupado. With Chargepod, you take up one outlet in one power strip and you're done. Although the fanned-out orientation while charging makes it take up about a square foot's worth of surface area, it doesn't occupy all that much space when compared to individual chargers. Then there's just the coolness of (there are six blue LEDs that tell you when something's inserted) being able to charge all your stuff with the same device. The basics of Chargepod are obvious from the picture. You have one center base station with a lead that plugs into the wall. 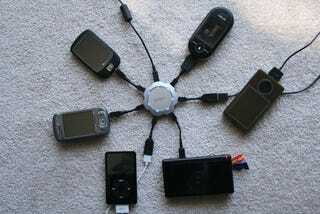 Then you've got six interchangeable adapters that you can plug just about anything into. As for the chargers, there's USB, miniUSB, BlackBerry, Motorola, Sony Ericsson (phones and Bluetooth headsets), Sanyo, Samsung phones, Samsung headsets, Qualcomm, Kyocera, Audiovox, LG, Toshiba, Pantech, Palm (Treo, LifeDrive, Tungsten), Nokia, DS, DS Lite, Game Boy Advance, Game Boy Micro, Nextel, Jabra, Sidekick, and various other phones I forgot to list. Essentially, it covers the whole spectrum of phones, headsets, and other gadgets. Here's the downside: price. The base unit costs $49 and additional charger tips costs $9.95. This means that you'll have to buy at least five extra adapters (your first one's free) in order to fill up the entire body. That's over $100 to get yourself set up. At this point, we can recommend Chargepod based on its convenience and ability to charge things as well as individual chargers, but if Callpod can get the price somewhere down to $39 for the base unit and $5 or $6 per adapter, then we can recommend this to everyone—even the cash strapped.